France & Switzerland crowned Mainland Champions! Congratulations to France, winning the Men's and Women's Open Division as well as the overall Mainland Cup title on points! 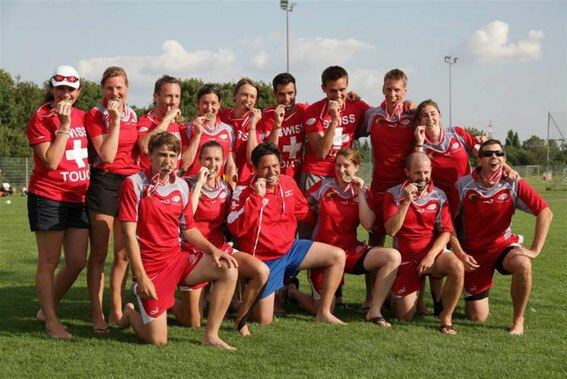 Switzerland claimed the Mixed Open Title, defeating France by one point in a close run. 29 Referees and 6 Referee Coaches made it possible to play over 40 great games of Touch on the highest European level at Mainland Cup 2013. Many thanks to each and every one of them! Perfect weather & field conditions, as well as the efforts of Derek Fisher as European Director of Referees, Tom Bedkowski as Tournament Director, the many volunteers and the Austrian organizational team made the Mainland Cup 2013 a tournament to remember. Congratulations also to all the other participating teams and players: whether it was your first international win, the first international touchdown or just a great time you spent with your team mates: Touch Austria hopes that all of you enjoyed playing at the Mainland Cup 2013 and is looking forward to see you again at the Brett Barclay Cup (former ACC Cup) in Vienna (7th September 2013) and the Euros 2014 in Wales! See all the pictures of Mainland Cup 2013 here! If you have to do some urgent grocery shopping, here are all the supermarkets which are close to the stadium. 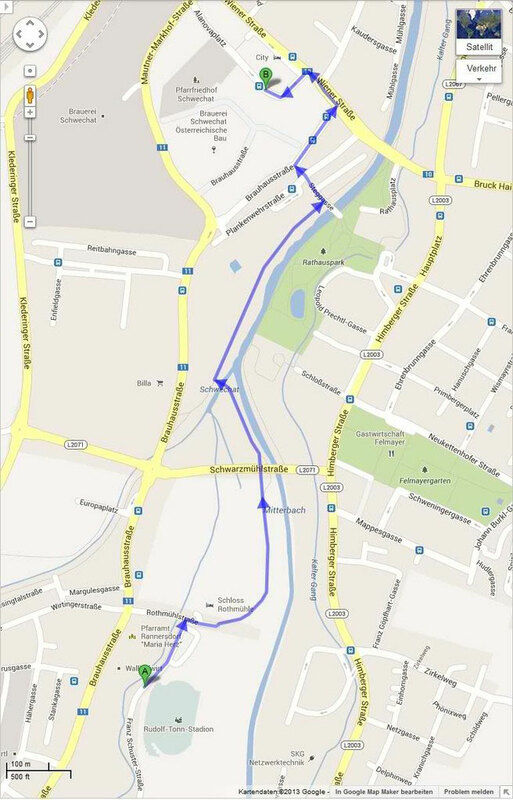 How to get to the After Party at Brauhaus. See map on the left. 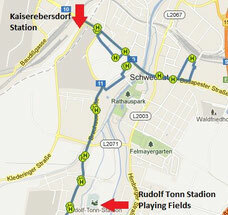 The distance between the stadium and Brauhaus is approx. 2 kilometres (about 25 minutes walk). Update on how to get to the Managers Meeting and FIT AGM on friday available at Manager Meeting / FIT AGM. Also more detailed information about public transport in Schwechat (Bus 217) and how to get around Schwechat on saturday and sunday besides the Mainland Cup shuttle bus. The Mainland Cup Shuttle Bus timetable has now been confirmed. You can find the departure times under Event Info and Transport. Please keep in mind that the same Bus picks up all teams after each other, so please be ready 5 min before your departure time that the Bus won't be deayed for the other teams. Thank you very much! Click here for Shuttle Bus departure times and alternative transport option. Watch this section for updated playing results during the tournament. Apart from the Mainland Cup 2013-Champion trophies in the WO, MXO and MO divisions, there'll also be a MVP award in each division. The Mainland Cup 2013 tournament information brief No.2 was sent out to National Touch Associations today. Please feel free to circulate it amonst players and officials.You can additionaly dowload it here. 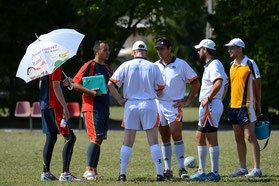 We are currently preparing the second Info Brief for the Mainland Cup 2013. It will supply details about player registration processes, stadion facilities and pitches, lunch and dinner options, the Austrian weather in July, the evening function and more. Touch Austria mourns the loss of Siva Nadarajah, who passed away unexpectedly last Monday. Siva was the founder of the Austrian Cricket Club (ACC), and together with Brett Barclay, was a driving force behind the ACC Touch Club. He was a mentor, guide and benefactor of Touch in Austria, as well as for many other sports like Cricket or Australian Football. Siva gave Touch Austria a home at the grounds of the ACC and a family with the ACC Touch Club. We are enormously grateful to have known him, his generosity and his vision for the development of small sports in Austria. Siva enabled Touch Austria to grow and flourish and he will always remain part of our team. Our heartfelt condolences go to the whole family and our thoughts and prayers are with them at this difficult time. Sponsoring information available now on the Mainland Cup 2013 website. 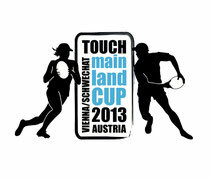 Touch Austria has released a sponsoring brochure containing detailed information on how your company can support the Mainland Cup 2013 event and the sport of Touch in Austria. The brochure is available for download in German, and will soon be followed by an English version. For those looking to see or learn more about Vienna and its surroundings, Vienna Explorer has you covered. Vienna Explorer is run by Austrian Touch player Adam and he offers a variety of city tours and day trips. Their most popular tours are out to the Wachau valley, which is home to some of Austria's best wineries and wine taverns. More Info on their website and here. Good news for Touch mummies and daddies! Judith’s Frecher Zwerg products will also be available to purchase at the Mainland Cup 2013 – so look out for the Frecher Zwerg sign! “It is so great to see touch start up in Austria. Back in 2002 I founded the sport in Germany, Munich, and bought the green stone hook cup which Germany and France still play for I think. So for me to see the Mainland Cup now being the trophy and reward to team work and spirit it makes me so proud you share the same passion for the sport. 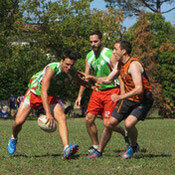 The Green Stone Hook was an annual Touch tournament between Germany and France which then became the Mainland Cup in 2007. Thank you Matthew for starting it all and we hope to see you around our neck of the woods someday! We have a new fun fact from Maritini about his favorite "sphere" in Vienna (the Republic of Kugelmugel, a self declared Micronation at the Wiener Würstelprater) and a guide to the best summer hangouts at the Donaukanal from Kati. Read more at Visiting Vienna. Today we are very exited to launch the new Mainland Cup 2013 Facebook Page and Website!! Have a look around and find all the relevant information about the upcoming event in Vienna/Schwechat. 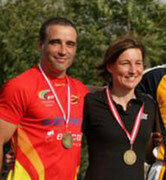 Teams from Catalonia, France, Germany, Hungary, Monaco, Netherlands, Spain and Switzerland have all expressed their interest to compete in the women's, men's, mixed open and senior divisions at the Mainland Cup 2013. Also an invitational team from Guernsey plan to come to Vienna. Final teams and divisions are to be confirmed soon. Su 14th July: Pools Games; Finals; Evening Function with Band. for more information see the 'Preliminary Brief No.1' at Downloads. The first Preliminary Brief has been published. Find all the important information concerning acommodation, travel, location and much more, available in the Preliminary Brief No.1 in the downloads section.